Deck view Oceanfront living room with deck. 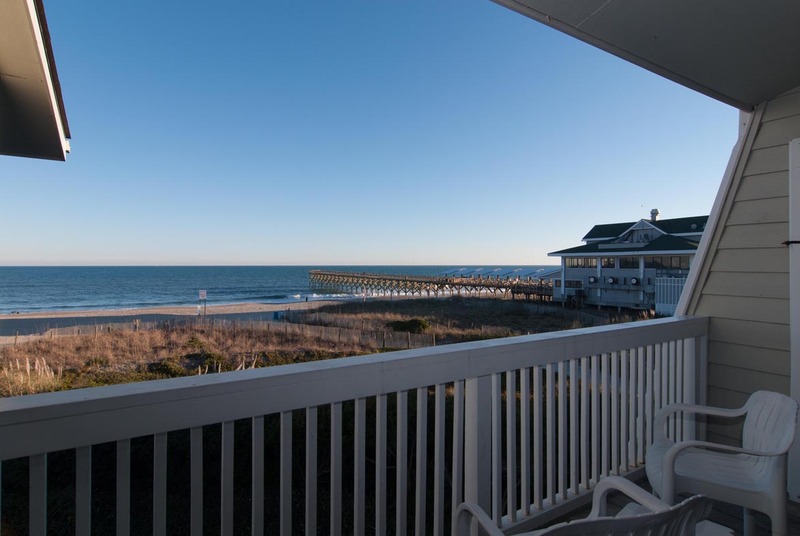 Watch the beach, the sunrise or 500+ Time Warner Cable channels and tons of movie channels (Epix, Starz, HBO, Encore & Showtime) The view from the living room deck Deck view Oceanfront living room with deck. Oceanfront living room with deck looking into the dining area Living area Dining areas Dining area Kitchen Deck off the kitchen with a comfortable table for 4. Kitchen Kitchen Main living level hall bathroom. 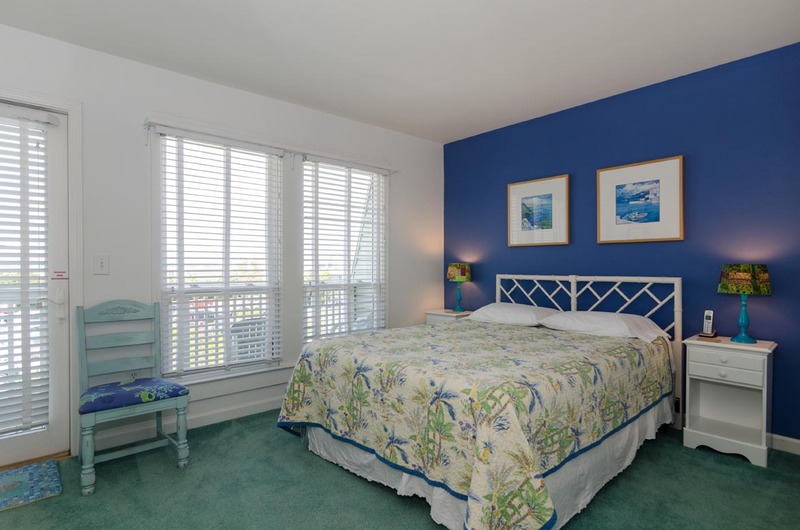 Master bedroom with king bed, private bathroom and oceanfront deck Master bedroom with king bed, private bathroom and oceanfront deck Master bedroom with king bed, private bathroom and oceanfront deck Master bathroom. Guest bathroom Bedroom 2 with one queen size bed Front bedroom private deck, facing west. Bedroom 2 with one queen size bed Bedroom 3 with two twin size beds Bedroom 3 with two twin size beds Loft bedroom with two twin size beds The loft has 2 twins, a dresser and storage closet. Cable-enabled TV mounted on the wall. 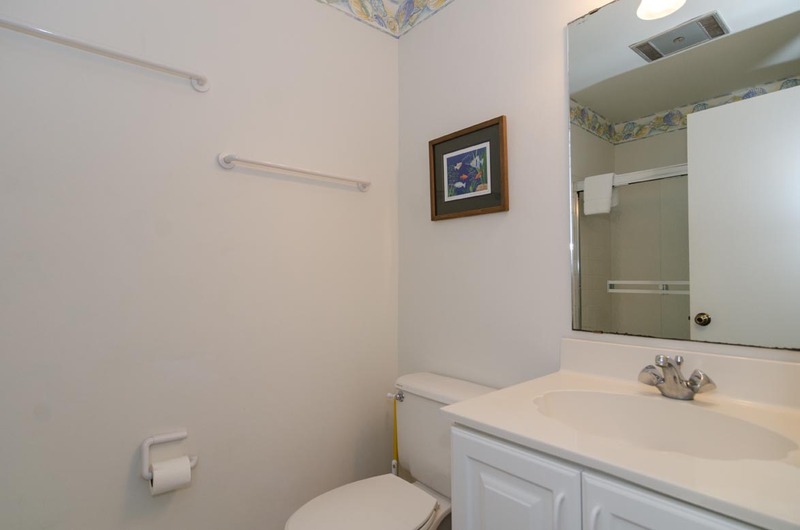 Half bathroom on main living level. 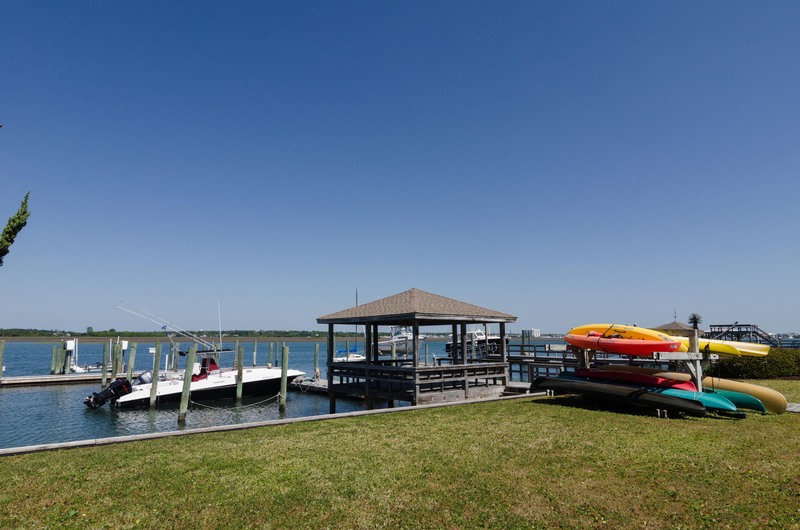 Parking for Lumina 5 is under the house, and can fit 3 cars or a boat trailer Private BBQ area Entrance to Lumina Club private dock and gazebo Lumina Club private dock and gazebo Lumina Club private dock and gazebo Inside the Lumina Club private gazebo Lumina Club private dock. 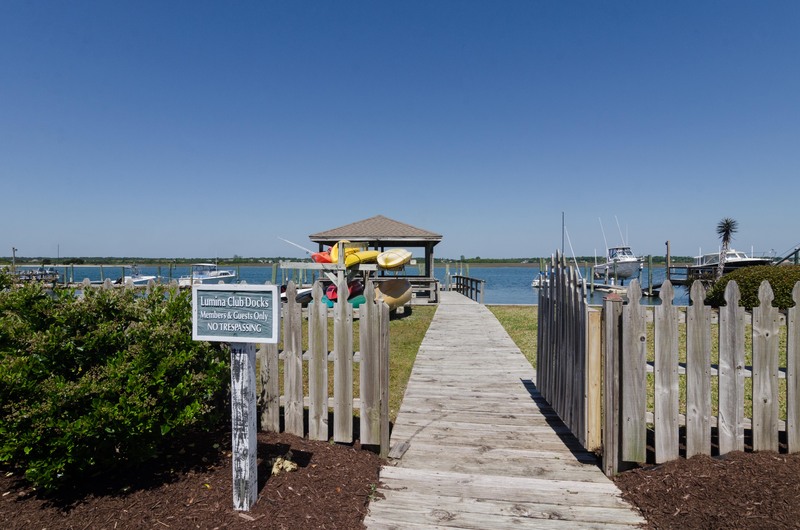 From this view, our slip is at 1pm, one of the slips facing into the ICWW View upon approach from S. Lumina Ave. Aerial view of the Lumina Club private docks Aerial view of Lumina Townhomes The beach is where you want to be this summer ! 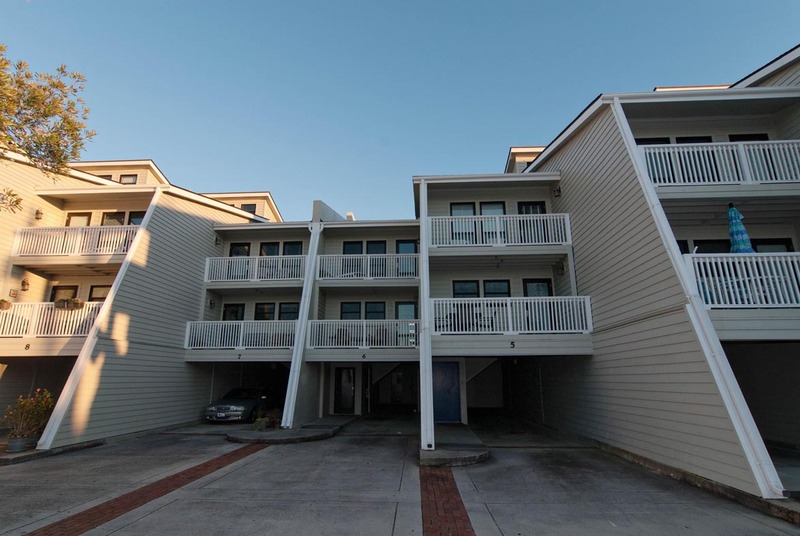 OCEANFRONT LUMINA CLUB TOWNHOUSE WITH 28' DEEP WATER SLIP - Family and friends will relish the breathtaking beach views and welcoming ocean sounds at this comfortable and well appointed ocean front townhome with 4 BR (4th bedroom is loft) and 2.5 bathrooms. New carpeting has been added to this lovely townhome and picture are soon to follow! 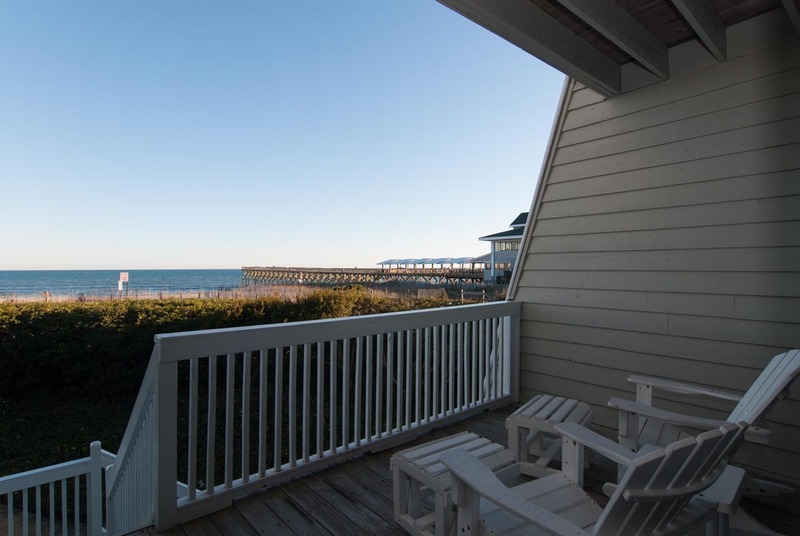 Four private decks let the sea breezes and ocean sounds lull you into total relaxation any time of the year. A three minute walk brings you to Crystal Pier and the award-winning Oceanic Restaurant, as well as to Lumina Club's private docks and covered gazebo on Banks Channel. Boat owners have exclusive use of Lumina 5’s own 28' deep-water boat slip, perfect for securely docking your boat or watching the sunset over the Intracoastal Waterway. 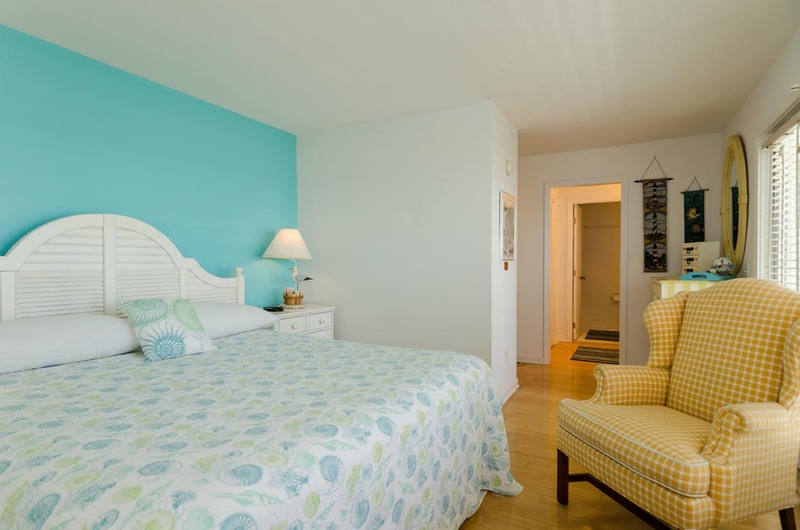 The great room and master bedroom offer expansive ocean views. The modern kitchen opens to a deck with outdoor dining and amazing sunset views. The dining room is adjacent to the great room, with comfortable seating for 10 guests. 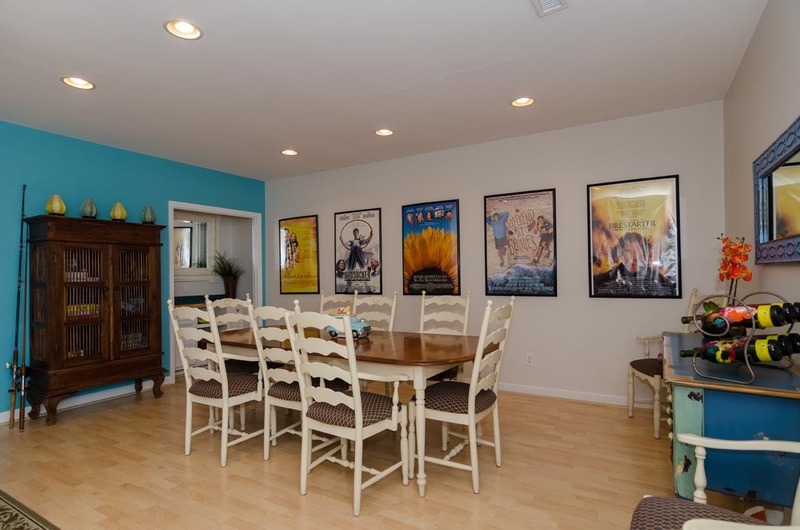 Film posters from movies produced in the Wilmington / Wrightsville Beach area adorn the dining room walls. 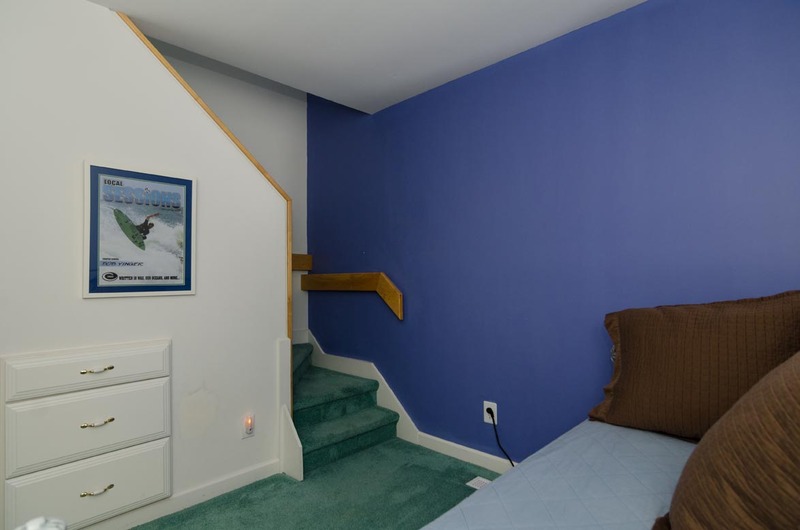 The fourth bedroom/loft is accessible by stairs through the middle bedroom. The loft area has its own auxiliary window AC unit for added guest comfort. 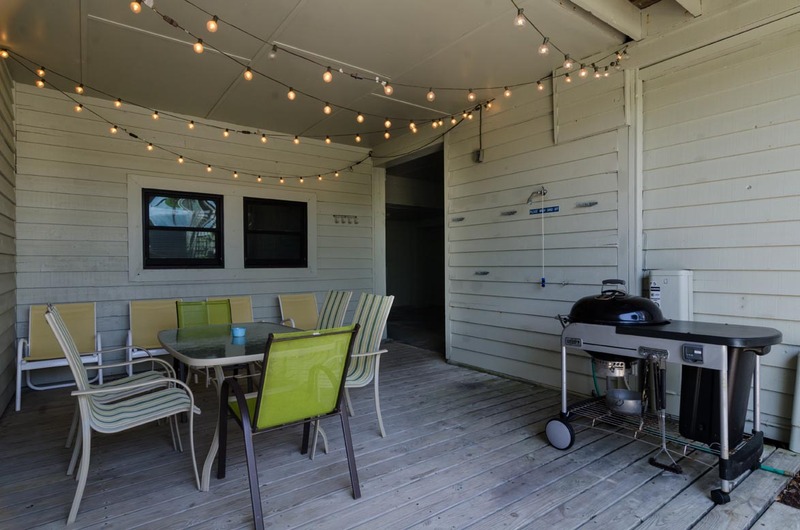 The ground level offers a laundry room and storage area, 3-car or boat trailer covered parking (one behind the other), outdoor shower and well-lighted BBQ area with outside dining table. Included in the rental is complete access to the movie channels HBO, Starz, Cinemax, Showtime and Encore. 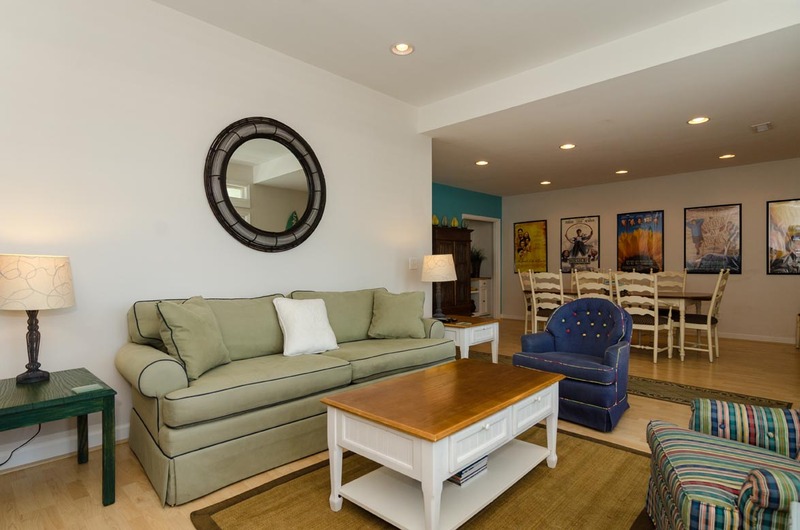 This well-designed beach townhome lets families and friends enjoy quality time together, but with the option of private decks, a covered gazebo or even the beach you'll also find a perfect spot for private relaxation. Enjoy! Occupancy: 8. No Pets. No Smoking. Lumina 5 was absolutely perfect, I felt so lucky to be right there ! 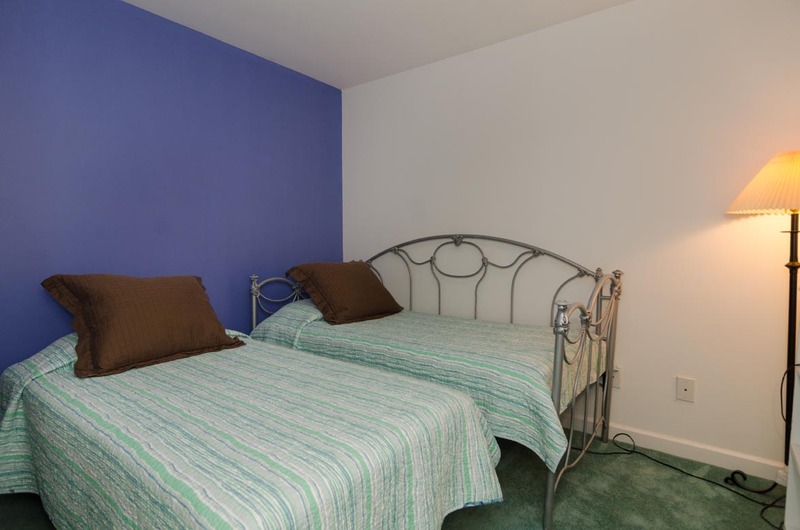 This property is in a great location and we had a wonderful stay. Noticed on Saturday morning that the refrigerator had stopped working but Bryant real estate sent someone right away to fix the problem!!! Had all the amenities we needed. Follow their instructions for cooling the loft bedroom ...it definitely works😊. 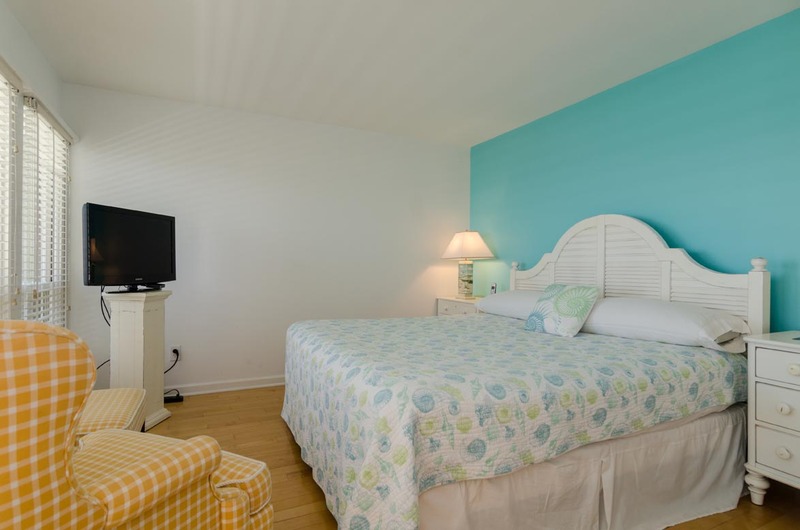 We would recommend this property and would stay here again! The pictures do not do this unit justice, it was way better than what we expected, espcially for the reasonable price! The unit was 3 stories tall and incredibly spacious. 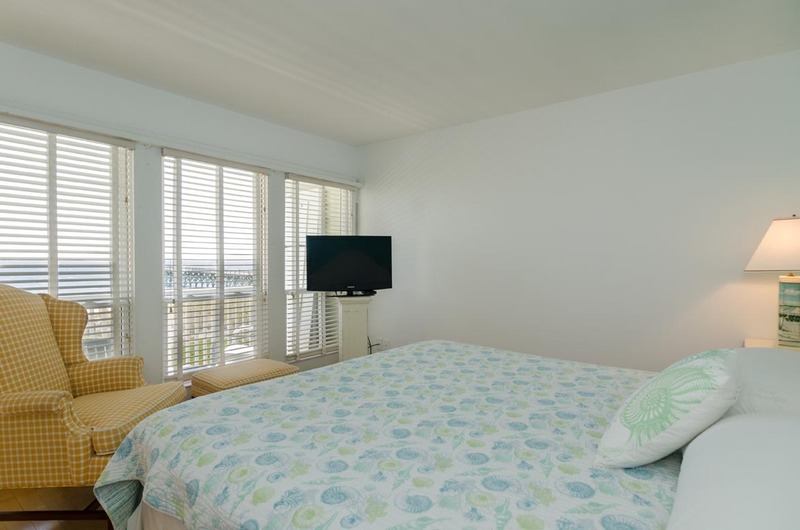 By far my favorite thing was both the master bedroom and living room each having a balcony with an amazing view of the beach. The location was also an easy walk down the beach to get to the main street of Wrightsville which we did several times. I highly recommend to anyone considering a weekend in Wrightsville. We had a great time! The townhouse was perfect for our family. Right on the beach and a nice quiet location. We loved it! Despite the weather being lousy, we all had a fantastic time. Great location for everything you would ever need. Everything was nice at the property except there wasn't a separate air conditioner in the loft. In order to have it cool enough you had to keep the whole house too cool during the day & night and still the loft was too warm during the day on the 90 degree days. Because we need the loft, we won't return unless they add AC. If you don't need the loft I would recommend the property. I hope you add AC before next year because we would love to return. UPDATE: As of March 2019, the property owner has added an auxiliary window AC unit to the loft area for added guest comfort. We thoroughly enjoyed our vacation at the Lumina 5 condo. We had our extended family and grandchildren and everyone had a great time. The location is perfect and the beach access was so great with the little ones. The condo had beach chairs and toys that really helped out. We really enjoyed the grill and patio downstairs! The kitchen was very well appointed (especially after I bought whole bean coffee and found that they had a spice mill so we could grind the coffee and saved a trip back to Costco!). We plan to come back!! We really liked this unit. 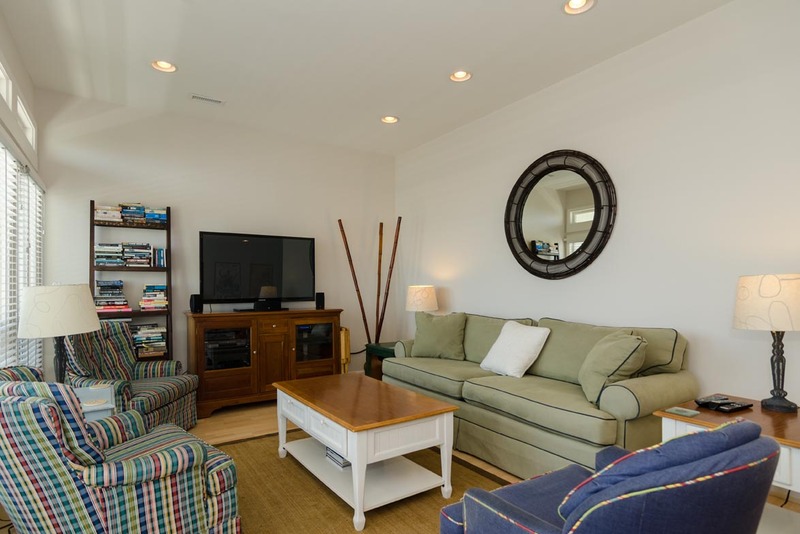 It was nicely decorated, good layout and super convenient to the beach. We did report that the cooling system was not really handling the third floor loft. It was just too warm up there even with the fans going. Other than that, it was a good rental. UPDATE: As of March 2019, the property owner has added an auxiliary window AC unit to the loft area for added guest comfort. Hello Kelly - thank you for the feedback, but we are sorry you had some issues during your stay. I see that you stayed on 6/10-6/17 and we inspected the AC unit during your stay. During our visit it was reading fine, however, we did turn out to have an issue. The following week we discovered a control board was bad and had to be replaced. This could have caused the unit to work intermittently, allowing it to work fine for a while, then stop working. The effects would have been felt in the 3rd floor loft first. We apologize that this issue occurred during your stay, but we wanted to let you know that it has been fully remedied and the system is running well now. We look forward to hosting your and your family again in the future! Home was great! 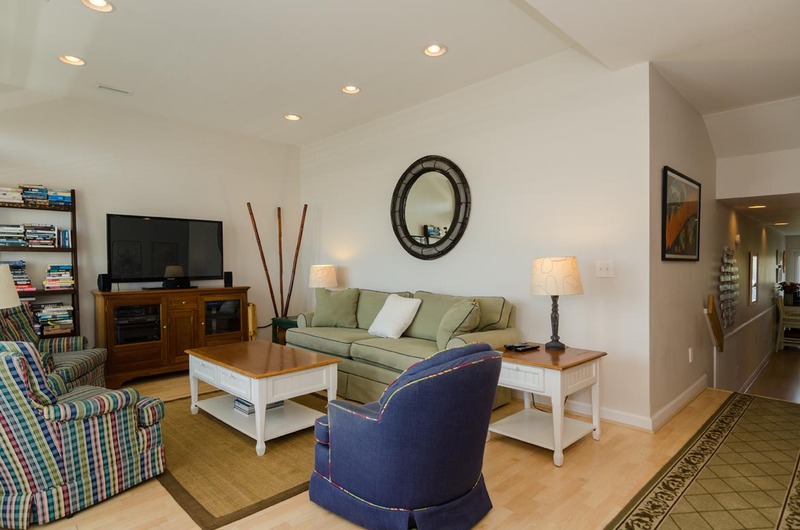 Awesome location, very clean, comfortable and well-equipped. Perfect for 8 family members. Super easy after hours check-in and late check-out. Our family thoroughly enjoyed our stay. We only encountered a slow drain issue in the master bathroom shower but other than that no other problems. There are a lot of stairs so if someone has issues with mobility that would be the only reason I would not recommend it. It was a little older however well-equipped, very comfortable and suited our needs. This house was perfect! We had three couples stay for homecoming at UNCW. The kitchen was well equipped, the view beautiful and the house was spotless! The location is incredible! The condo is very nice and clean. The bathrooms are a little old and the tub in the second floor bathroom didn't drain very well. 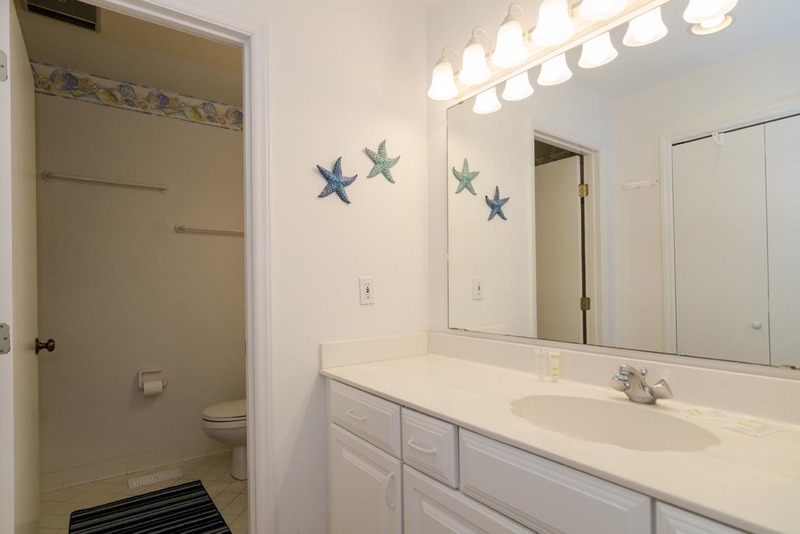 The master bathroom could use a little updating. Other than that, the condo is great, parking for 3 car is an advantage and the check-in/check-out was a breeze. 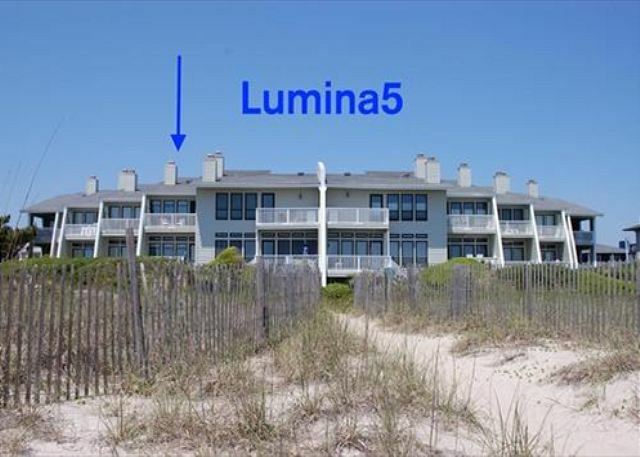 I highly recommend Lumina 5. We were 2 couples in from Ohio for a late January week off on the beach. If you haven’t stayed on Wrightsville Beach during the off-season (anything between Nov and March), we highly recommend it. It’s quiet, usually not bad weather, and it’s only you and the locals. Since we were all able to work remotely from our ‘second home’ as we called it, we all got into a routine of morning coffee on the beach deck, lunch on kitchen deck and dinner sometimes in the BBQ area under the beach deck or we went out (which was awesome because there weren’t any crowds. Wilmington has some AMAZING restaurants). Anyway, the home is warm, comfortable, large enough for everyone to have their individual space, and well equipped with anything you need. The beach view was beautiful and the location was very quiet with plenty of privacy. You’re only a few feet from the water, so morning runs on the beach were awesome. And easy! Definitely recommend this home. Wife's birthday weekend and we decided to do a rental over staying at a nice hotel and we definitely made the right call with Lumina5. The pictures do not begin to do this unit justice. 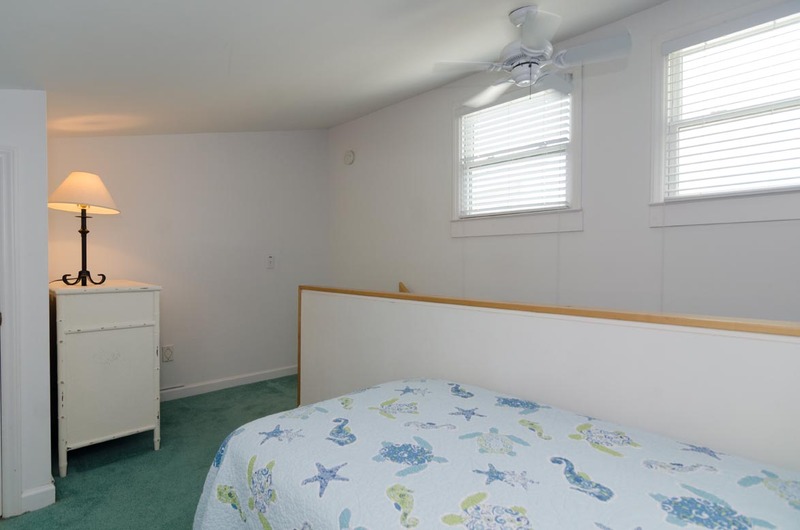 Very clean, very appropriate beach/Wrightsville Beach themed interior decorating. It looked great and felt very comfortable, like a home away from home. A/C worked perfectly, multiple TVs with cable worked perfectly. Access to the beach only took walking down the patio steps and making a few steps along the very short path to the beach (public access 36). It was a "block" away from Oceanic which had fresh amazing seafood , better than the Wilmington restaurant we visited! The only glitch was that the internet was very weak and very spotty during our stay. THEY called ME try to address the issue before we could even bring it up, but nothing fixed it during our stay. Although my wife works in tech and we are both gadget and social media friendly, we didnt mind forgetting about our phones and laptops and soaking in the beautiful ocean views! I'd go back again in a heartbeat. 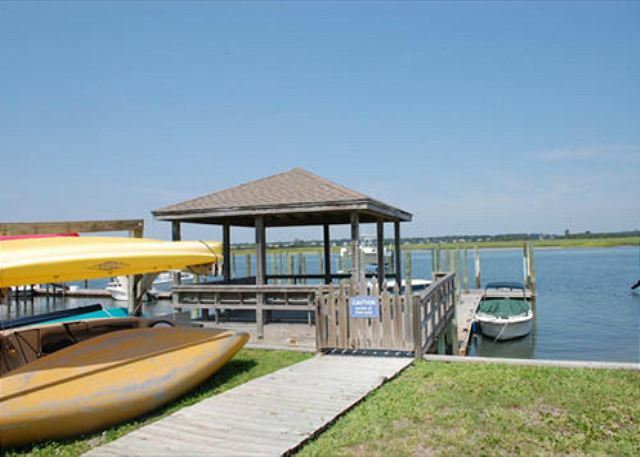 We chose the property because it was oceanfront but also had sound side dock access. We used the dock access to launch our paddle boards. It worked out perfectly. The townhouse itself is nice but warning, there are a lot of different levels, meaning lots of stairs! The bathrooms and the green carpet were a bit dated, but the rest of the house was very nice. Many areas had wood flooring. Lots of outdoor space. Suggestion for the owners would be some ceiling fans, both indoors and out.